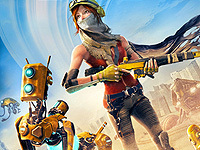 ReCore begins on the desert world of Far Eden as Joule Adams and her Corebot Mack are walking past the wreckage of her cryosleep Maintenance Habitat, or "Crawler", from which she previously woke. They venture out to obtain a power source to get the Crawler back online. Mack takes the scent and leads the way. They eventually reach the power Core, which Joule pries out with her Extractor. Joule and Mack then return to the Crawler, switching its power back on. Joule sets out to reactivate a Terraforming Pylon she learns has been offline for ninety-six years.